Discussed under Openings and Plackets. A peplum is a circular piece, four to five inches deep, set into the band of a corset cover to keep it in place. It is cut circular to do away with any unnecessary fulness at hips. Its front and lower edges are finished with narrow hems; the upper edge is set into the band of the corset cover. Fastenings: Use buttons and buttonholes. (d). Neck Line. - As the finish of the neck line may make or mar the appearance of the outer - garment, exquisite care should be given both to design and manipulation of materials. Fulness is sometimes held in place by means of tiny hand-run tucks (Fig. 143), by gathers, or by passing a narrow ribbon through eyelets worked in the top of the garment, or through lace or embroidery beading, footing, etc. (Figs. 143 to 150, and 156). This makes a very attractive and satisfactory finish for application of lace and other types of decoration. To make: Turn a very narrow him to the right side and baste; fold hem back to wrong side and crease firmly. 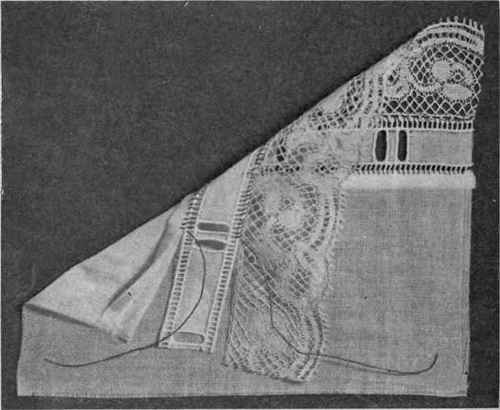 The trimming for the edge, beading, lace or footing, is then overhanded to the double fold thus formed. Fig. 143. - Fine hand-run tucks. (1) Beading (embroidered, or lace, through which ribbon can be run), and Lace. 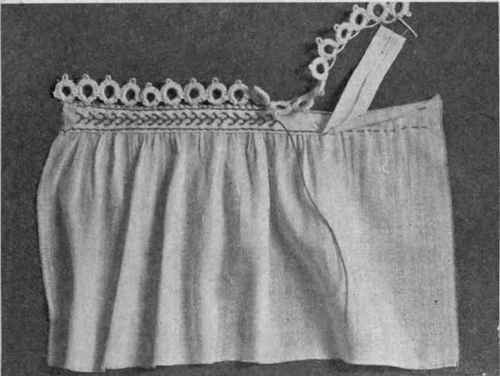 Overhand beading to hem and lace to upper edge of beading (Fig. 144). 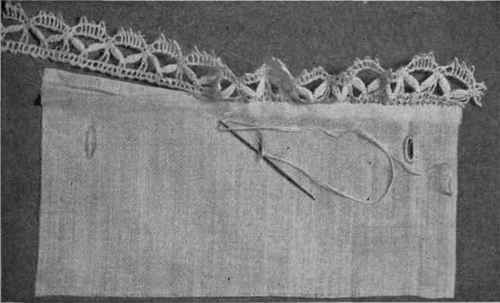 (2) Insertion (lace), Entre-deux and Footing. 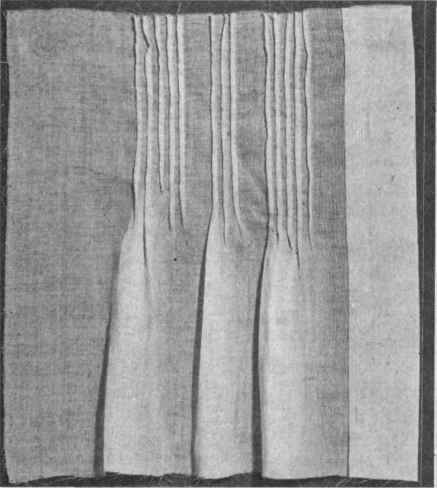 Overhand insertion to the hem, entre-deux (plain material cut away to cord, or to within one-eighth inch of cord) to the insertion, and both edges of footing (which has been folded through the center) to the upper edge, of the entre-deux (Fig. 145). Fig. 144. - French hem, embroidered beading and lace used as decoration. 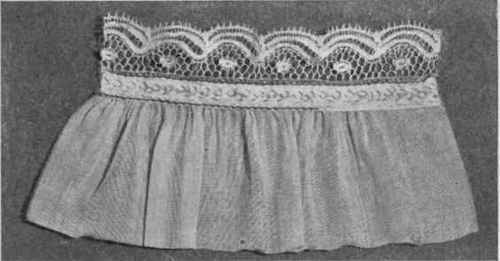 Overhand lace to hem. Work eyelets below hem to pass ribbon through (Fig. 146). Hem may be plain or edge of garment featherstitched over the hem (Fig. 147). 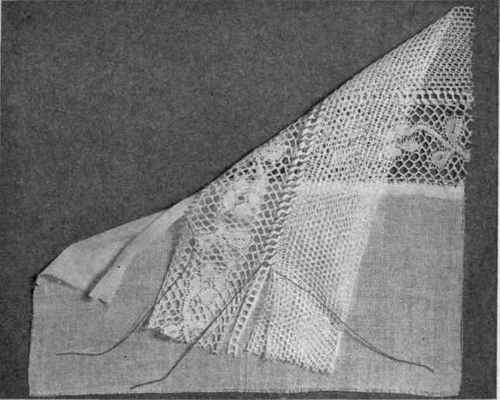 Gathers: (1) Entre-deux and Lace. 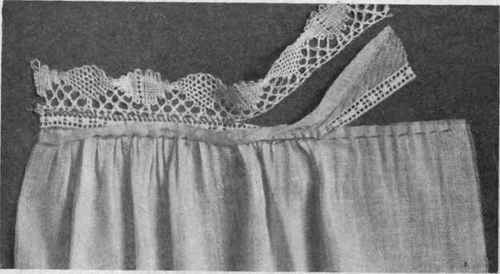 - Gathers at the neck may be set into entre-deux with a seam, bound with margin of entre-deux and lace overhanded to the upper edge of the entre-deux (Fig. 148). Place a row of gathers one-eighth inch from the edge of the garment; a second row, the width of the finishing braid, below the first row. Lay the upper edge of any attractive finishing braid, or bias fold, on the first row of gathers (on the wrong side of garment), letting the opposite edge of the braid extend beyond the edge of the garment. Turn the braid to the right side of the garment, crease the upper edge of the garment, and baste the lower edge of the braid to the garment, over the second row of gathers, and stitch to place. Lace may then be overhanded to the braid. If bias bands are used, featherstitching, lazy-daisy or some such decoration will add to the appearance of the garment (Figs. 149 and 150). Fig. 145. - Lace insertion, entre-deux and footing used as decoration. Fig. 146. - French hem, lace and eyelets used as decoration. Fig. 147. - French hem, lace edge overhanded to hem, and hem featherstitched. Fig. 148. - Entre-deux and lace edging used as decoration and facing for gathered edge of garment. Fig. 149. - Bias fold of material, tatting and featherstitching used as decoration. FIG. 150. - Featherstitched finishing, braid and lace used as decoration.